The final results of the 2017 B.C. election are in, but it could be a while before voters know who will form government. The final results of the 2017 B.C. election are now in, but it could be a while before voters know who will form government. With the NDP winning Courtenay-Comox by 189 votes, it leaves the B.C. Liberals with 43 seats — one short of a majority — the NDP at 41 and the Green Party at 3. NDP Leader John Horgan told reporters that his party and the Greens have been in negotiations. "I'm optimistic we'll be able to put forward a framework that has a majority of the support in the legislature," he said. "We don't have that today." Horgan said it was important for his party and the Greens to work quickly, but indicated it might be a few days before any further announcement is made. "We don't want to be too hasty. We want to make sure we get this right ... we've had productive discussions, and we have more planned." For his part, Green Party Leader Andrew Weaver said that his party was negotiating with both the NDP and the Liberal Party, but was hopeful the situation would be clarified by next Wednesday, when the writ is returned to the Lieutenant Governor. "It's important to give British Columbians some sense of certainty. That is our goal," he said. "We recognize that British Columbians have put a burden of responsibility on us to do the right thing, and we take that seriously." ​He indicated that any arrangement made with the NDP or Liberals wouldn't be in the short term. "I don't think British Columbians want anyone to go back to the polls anytime soon," he said. "We have said to both parties we're willing to negotiate in the long term. There's nothing magical about two years. There's nothing magical about three years, and frankly, there's nothing stopping us from looking for four years." 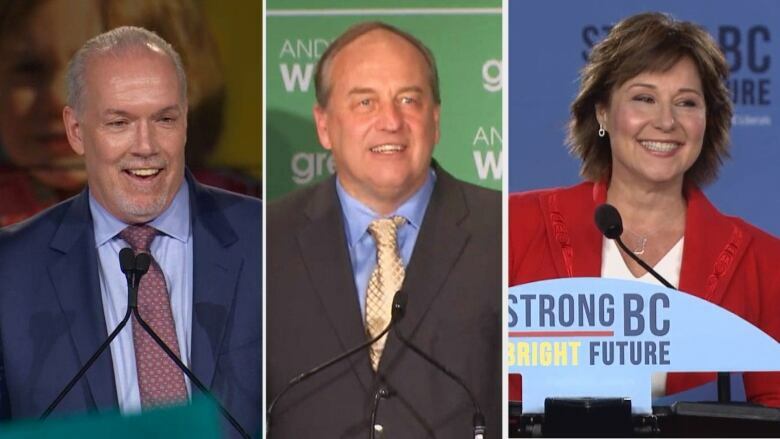 The two biggest conditions Green Party leader Andrew Weaver has mentioned as necessary for his party's support in the legislature have been banning corporate and union donations and changing B.C. 's electoral system. Horgan said he agreed with the Green Party on those points — and had been discussing other issues as well, including child care — but that he disagreed with Weaver's stance that electoral reform didn't require a referendum. "If you're going to change the electoral system, you should ask the people about that. It's their system, not mine," he said. "We've talked about it, so I guess that makes it negotiable, but it's not something I want to concede." Liberal Leader Christy Clark is not expected to speak on Wednesday, but did issue a statement saying that "with 43 B.C. Liberal candidates elected as MLAs, and a plurality in the legislature, we have a responsibility to move forward and form a government." That statement, however, was firmly rejected by Weaver. "Actually, the premier erred in that statement. The premier has a responsibility to ensure she gains the confidence of the house to form government," he said. "I would suggest that was a bit premature. We have not tested the confidence of the house yet."